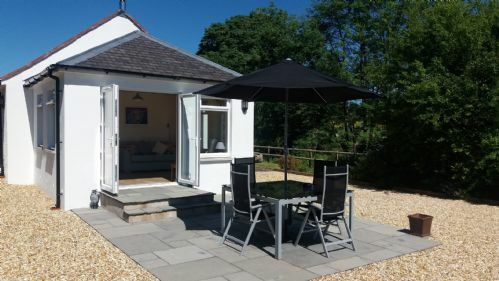 Riverside Cottage is a high quality, 2 bedroom self-catering holiday cottage nestled on the banks of the river Dryfe in the small, peaceful rural village of Boreland, a few miles north of Lockerbie in Dumfries & Galloway, Scotland. With a cosy wood burning fire, electric heating and a large, bright sunroom Riverside Cottage is the ideal place to relax, unwind and enjoy the peace and quiet of south west Scotland. Had a great week. Brilliant cottage in an amazing setting. Very welcoming hosts. Kates teas a must. Would love to return. Just the place to relax and unwind! Lovely cottage, beautifully decorated with everything thought of. The welcome pack was a very nice touch. We would have no hesitation recommending it for a relaxing break in very picturesque surroundings. The owners live next door and are very helpful. Excellent stay at this very well equipped cottage. We stayed at Riverside Cottage on a trip to find a new house in the area. The trip was a success in that we will be moving into a new home in the next few weeks. The cottage was a very good base to do our house viewings from has it had everything we needed to make our stay as comfortable as possible. The location is superb with views over the river to field and hills which during our stay had a number of horses running around. We had two visits from a Red Squirrel, a first for us, as well as flocks of different birds. The cottage is ideal for anyone who enjoys peace and quiet in a wonderful location with a very well equipped and excellent cottage. Stayed at Riverside Cottage for 4 nights in November. Cottage very clean and cosy and arrival instructions given to ys well in advance. Did not meet Kate and Max during our stay due to them being on holiday buf Kate kept in touch with us before, during and after our stay to make sure we were comfortable. Good location for exploring and would recommend. We have had a lovely fortnight in this beautiful holiday cottage, so comfortable, relaxed and cosy. Kate, your food has been spectacular: as well as the main meals, the soup was wonderful and afternoon tea was out of this world, so good we had to order an extra one. We have had a great time exploring the area. We would particularly recommend Dawyck Botanic Gardens, the Wetland Centre at Caerlaverock and walking up past Grey Mare's Tail to Loch Skene. Thank you, too, for the suggestions of local forest walks: the walk around the Black Esk reservoir was our favourite, although Forest of Ae, Castle O'er and Mabie Forest were also very good. Above all, Kate and Max, your welcome was so warm and friendly - thank you for a lovely holiday. We often stay in holiday accommodation, this rates as one of the best .Renovated to a high standard and tastefully furnished and decorated.Kate and Max are very hospitable and Kate provides some delicious homemade treats on arrival .Will definately book again . This is a very well equipped and spotlessly clean cottage set in a quiet and peaceful location for a relaxing holiday. Kate and Max gave us a warm welcome on arrival and were on hand if needed for information about places to visit etc. A great "starter pack" of local treats awaited us and we would definitely recommend Kate's catering service (order from her menu two weeks before you go). This is a five star cottage with great attention to detail and would highly recommend a holiday at Riverside cottage. Awesome location and such a fabulous cottage where we had a relaxing holiday. Thanks to Kate & Max for their hospitality! Definitely recommend this cottage to anyone who wants to have a relaxing holiday and also Kate's catering service. Broadband is patchy as described in their website and there's no phone network which wasn't an issue for us. Max and Kate gave us a very warm welcome and were on hand if we needed them. The cottage was very well equipped and spotlessly clean. Situated in a quiet rural location. An ideal base for exploring the Dumfries and Galloway area and The Southern Uplands. The welcome pack was excellent and consisted of treats for those with a sweet tooth and essentials of tea, coffee and milk to name a few. To set this apart from others the owner runs her own catering business and from a menu can supply a range of meals including afternoon tea. We would give this a five star rating and would highly recommend a holiday at Riverside cottage. Lovely Cottage in an Idyllic setting next to the river. Very clean and modern and there’s plenty to do nearby. Really peaceful location to escape and unwind. Would recommend as a perfect place for a break. Owners very friendly and helpful and provide great welcome pack. If arranged in advance the owner can provide an excellent 3 course meal for you to warm in the oven upon arrival which we thoroughly enjoyed. We also took advantage of ordering a cream tea for the Sunday afternoon while we waited for our pre-ordered on-line grocery shopping to be delivered. After a long journey it meant we could instantly relax and unwind taking in the fabulous views from the cottage watching the abundant wildlife and enjoying the calming sound of the nearby river. Being not far from the motorway meant we could explore not only the attractions nearby but also further afield. Fabulous cottage in a quiet village. Great location from which to explore. V impressed by the cottage. It is very well equipped - Max and Kate have thought of everything. We loved the regular visits of the red squirrel and the beautiful views. It makes an excellent base to visit the area from Edinburgh to Kirkcudbright. We booked as a bit of a last minute 1/2 term panic and were so pleased when we arrived! Beautiful cottage finished to a great standard. The location is perfect, remote with beautiful views but still close enough to amenities. We loved it and our boys loved it. Will definatley be booking again. we received a warm welcome from the Kate, who was very friendly and showed us around the cottage explaining how everything worked. the cottage was warm and immaculate throughout, with everything we needed and beyond. 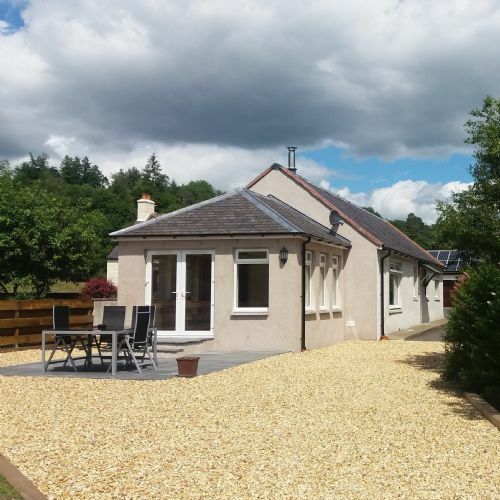 Beautifully presented and fully equipped cottage in rural location. 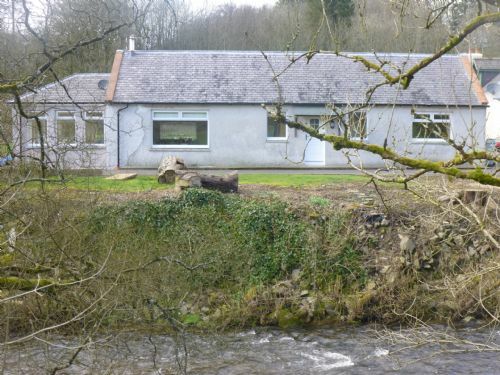 Quiet and peaceful location next to a fast flowing river with views from all windows of farmland and hills. Fully equipped with great attention to detail. A warm welcome with a selection of local produce. Cosy log burner. Overall first class. This is an excellent holiday cottage that has everything for a truly relaxing holiday and is worthy of 5 stars. Kate and Max are excellent hosts who will make you feel most welcome. Driving is an absolute pleasure in this area and we look forward to repeating our experience. We really enjoyed our time at riverside cottage and would highly recommend. The cottage is lovely, having been refurbished to a high standard, it is very light and spacious. We were made to feel very welcome by Kate & Max and they have thought of every little detail. There are nice sitting areas in and outside to enjoy the peace and quiet of the surrounding countryside and river. A great location with lots to see and do in the area and some lovely walks nearby. Riverside Cottage is in an idyllic location for peace and quiet. Accomadation is excellent and Kate and Max are excellent hosts . The cottage’s location is not only a great base for visiting local attractions, cycling and walking it is also perfect if you just want to relax, unwind and enjoy the peace and quiet. We managed to fit in a bit off everything. The inside finish and outdoor space is very impressive and certainly on par with many five-star accommodation cottages we have stayed in across the UK. We always look for that little bit extra and comfortable self-catering luxury accommodation in a quiet, rural location. To get this at a riverside spot was special. It’s been a busy year for us so the cottage was perfect to relax, enjoy some fresh air, recharge our batteries and cosy down in the evening with a few gins and box set! A very well equipped cottage in a stunning location.